How does so much water get into the atmosphere? Moisture is abundant in the air, with over 10,000 parts per million on a normal day. The moisture gets into the air through the evaporation of water. 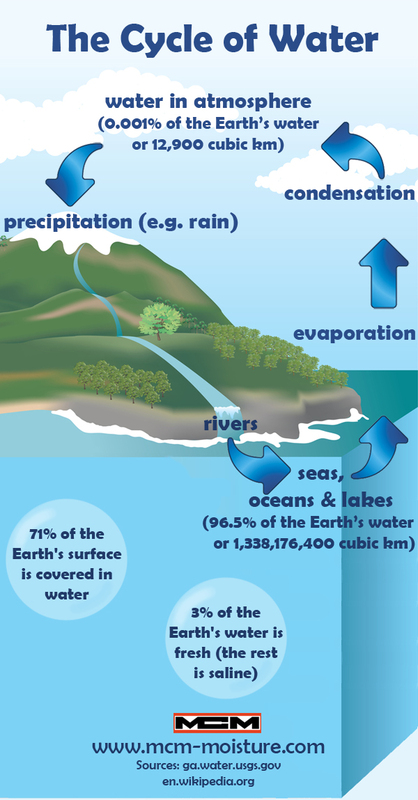 Given that 71% of the Earth's surface is covered in water, it is not surprising that there is so much moisture in the air. This is not normally a problem in day to day life, but in systems using gas, this moisture can cause havoc. For example, the presence of excess moisture in breathing apparatus used in cold climates can lead to freezing in the pressure regulator or ice blocking the orifice, causing an interruption to the supply of air to the user. If you would like to use this infographic on your own site then please do, but we request that you use the embed code below correctly to credit the work we have done. The Cycle of Water by MCM Moisture Control & Measurement.